Owning a pool is the ultimate statement, keeping it clean is the crucial challenge. You do not want to see horrible sights like dead leaves in the pool, the water losing its glistening blue color, and grime coating the sides of your beloved crown jewel. Who would want to go for a dip in such filthy waters? Not you! You also do not wish to spend incredulous amounts of time manually going over every inch with a brush, bent for the better part of the morning; thus, we will talk about getting the best pool cleaners for the job. For your local swimming pool needs turn to us. We are Grand Slam Pools is the premier Fort Myers and Naples pool cleaning services company in Florida. a. In-ground pool cleaners– They work best in submerged pools that are 8 feet or less deep. Deeper pools exist, and it requires specialized, expensive pool cleaners to make the cut. b. Above-ground pool cleaners— They also work in deep pools but be cautious since they are readily available concerning price and may strain your pool pump and filter. The size and shape of your pool determine the type of cleaner you should choose. Look at the type and needs of your pool, and compare with the performance of the filter for you to make an excellent choice. The size of your pool matters: Cleaning a large pool would not be fun with a manual pool cleaner. Flexibility: A cleaner should accommodate the diverse shapes of pools by being able to adjust main flow and hose buoyancy. Navigation of stairs: The equipment should show the ability to climb stairs. The length of the hose: When looking for the cleaner, make sure the hose it comes with, covers the length of the pool, plus an extra meter or two to spare. If you are a perfectionist and do not mind having a hands-on approach to cleaning your pool, a manual pool cleaner could be right for you. It looks like a vacuum cleaner and works well if you have an above ground pool or a small in ground pool. • Inertia-driven Suction Cleaners: It travels in the pool in a randomized pattern. It ploughs through the whole pool leaving no spot untouched. It is suitable for pools with curved walls. • Geared Suction Cleaners: They work fast and move in a set pattern plus are very convenient for pools having tight corners and stairs. Since they have lots of moving parts, they require much more maintenance. 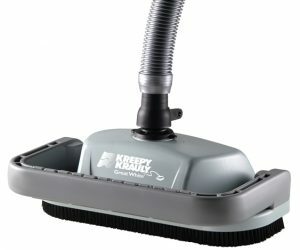 If your pool has lots of sand litter, this cleaner is ideal for the job. Sometimes large debris litters your pool. Litter like rocks and leaves are sucked in by this bulldog of a machine. It links with the pool filter through a hose. It employs water pressure to generate its vacuum enabling it to move all over the pool sucking in rocks and leaves into a bag. In the market, you will find models which have a booster pump. Such cleaners would need you to have an extra hose linked to the pool wall. If your pool does not accommodate this excess, then hunt for a better option. They work fast, can navigate tight corners, and collect large debris but cost more than suction cleaners. You need to have a source of power near the pool as they utilize electricity to run, and you can operate them remotely. They are ideal for large pools but are expensive of all pool cleaners. Shopping for pool cleaners has never been this easy now that Grand Slam Pools is here to provide you with the convenience and peace of mind by availing to you all the different pool cleaners, and professional advice and cleaning services.